yes, I am telling you about my underwear. 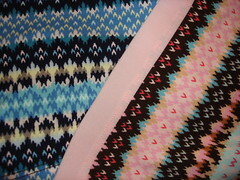 This weekend I found some underwear at the gap that has a fair isle print on it. Not-knitted knit underwear. Hooray! 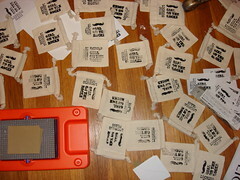 I finally had a chance to break in my Gocco, and do some printing for a new product tthat will hit my shop soon. i have a lot to learn and I think starting with the fabric paint was a little ambitious. I am happy with the results. Anyone knitting any exciting Halloween Costumes? 5 Responses to "No time for chit-chat"
so would you say that the fabric gocco is difficult to use? i am considering getting the fabric one but i think i\’ll use the paper version more so i\’m going to get that one instead…i\’m curious to see what people have to say about the fabric vs. paper uses of gocco. i\’m hoping to get mine before xmas! :o)ek. p.s. can\’t wait to see what the secret knitting project is! Ugh, I\’m soooooo jealous that you have a gocco! LOL Can\’t wait to see details of the Icord secret! The colors are lovely! 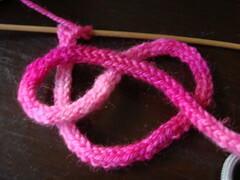 Hmm, pretty pink i-cord – very intriguing! Fabric paint? I’m intrigued… I didn’t realise Gocco on fabric was possible. Oh, wow, fellow gocco friend. Well done on the printing. I\\\\\\\’ll be keeping an eye out for your future projects….I too have a lot to learn but it\\\\\\\’s very exciting.